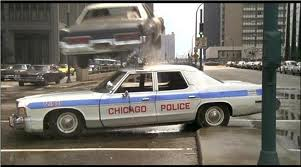 Police Departments and State Troopers in 11 states have joined forces to stop people from speeding on Interstate 80 during the 7 day “I-80 Challenge” from July 24th thru August 1st. 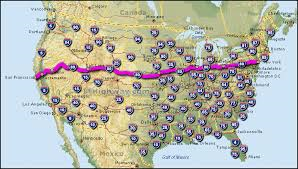 The extra police presence will be seen across all 2,900 miles of I-80, from Teaneck, NJ to downtown San Francisco, CA. Their slogan for this year’s challenge is “More cops, more stops”. 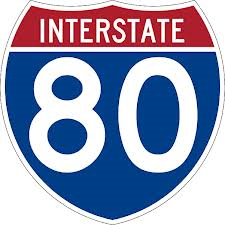 The I-80 Challenge is a multi-state awareness and high-visibility enforcement effort to encourage all drivers to drive safely on the Interstate 80 corridor and to support the efforts of the law enforcement officers who are out there every day making our roads safer. When it comes to D.I.Y. 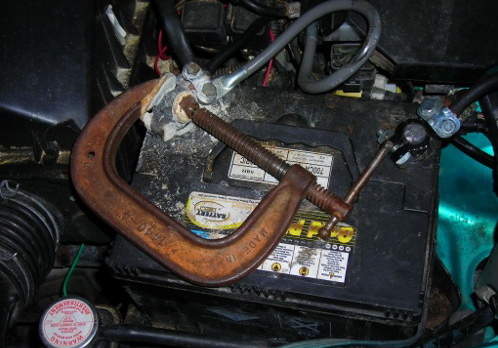 fixes on a budget, there are some pretty inventive folks out there. We’ve all seen the standard duct taped headlights, taped up windows, screws holding on body parts etc. so we’re not going to waste your time with any of that standard stuff. The picture above is by far my favorite D.I.Y. repair for your car’s a/c system. This one is intricate. 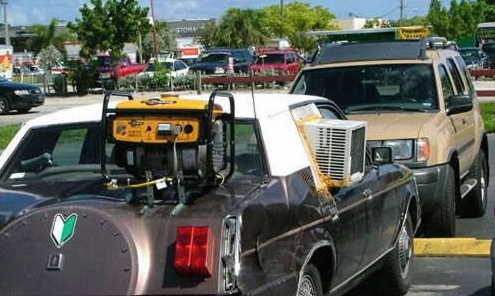 You’ll need a home a/c unit and a gas powered compressor to power the a/c unit. These folks did a great job with the install. They are definitely skilled at D.I.Y. projects and it shows! 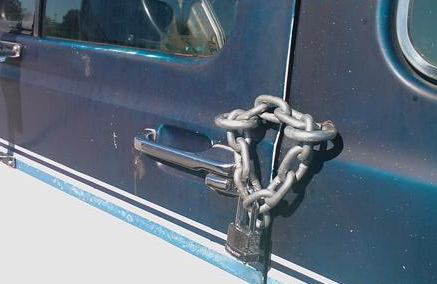 This next guy must have had security issues in the past, so he added an extra lock and chain that you’d normally see on a gate or maybe a bicycle. Very well done. 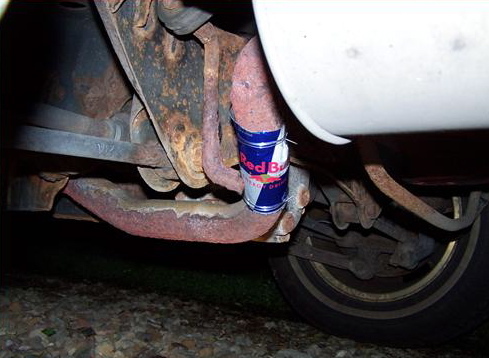 Next we have a pretty standard exhaust repair with a Red Bull aluminum can. It looks like this guy was also pretty skilled. The can is trimmed well and the fitment looks precise. I guess this van had a problem with the automatic open/closing factory doors. Why not add a little touch of class and solve that door problem at the same time? Good idea. 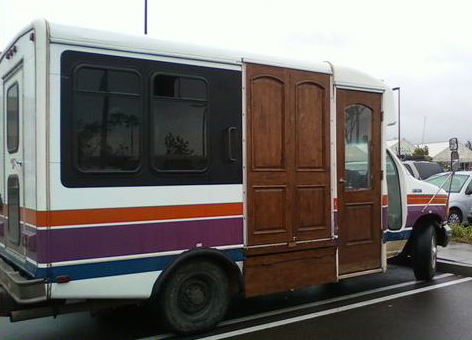 Now the problem is solved and this old style solid oak door let’s you know that this is a very classy vehicle. 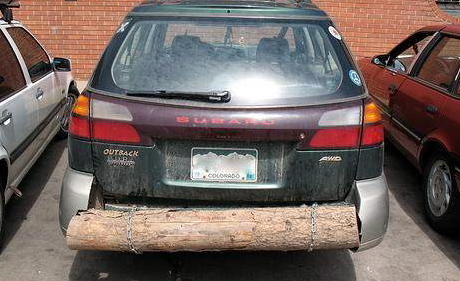 Here’s a nice sturdy log added to the back of the Subaru Outback as the rear bumper. Well done and eco friendly. 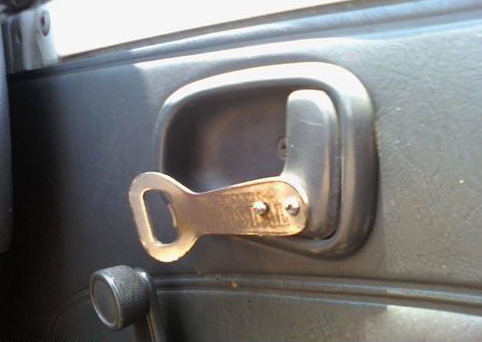 Here we have an interior door handle that broke off and was replaced with a bottle opener. Very classy touch. You can never find enough good uses for “C” clamps. These things usually lay around the workshop and get used one a decade. Good for this guy putting this clamp to good use. Next is a guy who put this little mirror to good use. This was a quick fix and it earned him a spot on the list. Most D.I.Y. solutions include either duct tape or vice grips, so this list would not be complete without at least one pic of someone putting the pliers to good use. 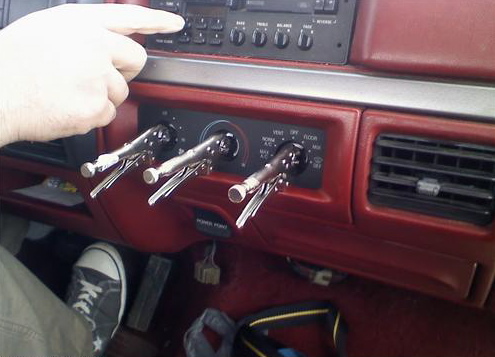 Knobs go bad all the time, here’s a quick and easy solution. Next is my 3rd favorite of all time. 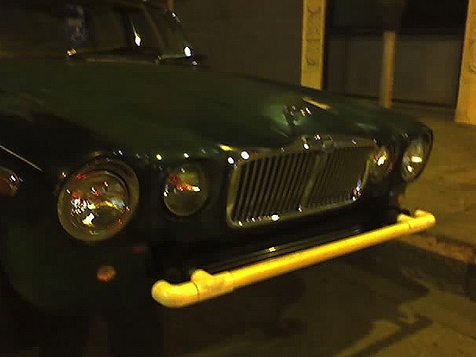 Talk about “pride of ownership”. If you lost the front emblem on any other car and could not or would not afford to replace it with a shiny new one…you’d just forget about it. A Mercedes-Benz owner is different. 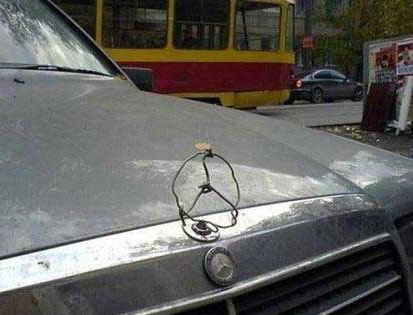 This person is so proud of their vehicle that they made a new emblem out of wire. Nice job! I saved the second best pic for last. Here’s a guy who knows how to get things done. That’s our list. 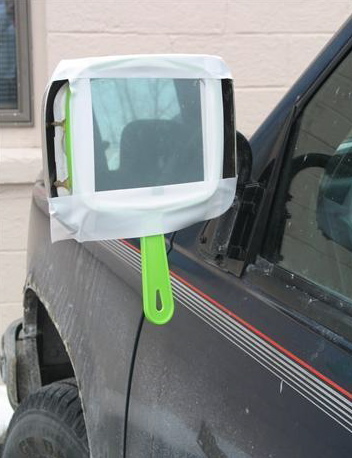 These are the best pics we could find showing the most inventive D.I.Y. 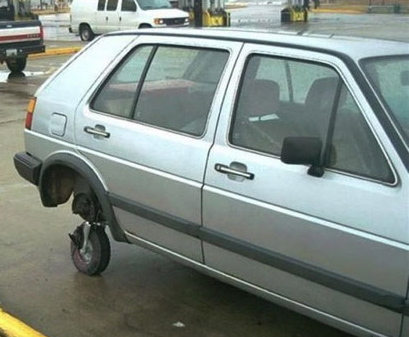 repairs to cars. Feel free to send your pics over to our email and we’ll post them if they’re worthy. Of course the 1st car is a BMW 3 Series. 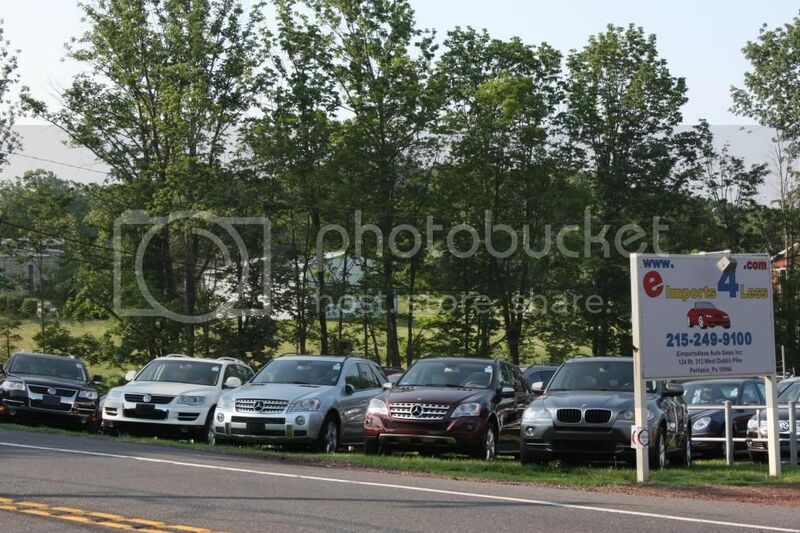 The staff here at eimports4Less are all big BMW fans, if you can’t tell that from our extensive BMW inventory and the cars in our driveways at home. We’re BMW nuts here. 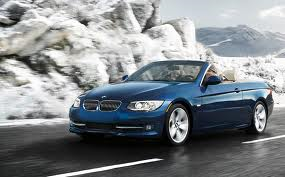 Our #1 pick for a family road trip this summer is the BMW 3 Series convertible. Any 2007-2013 will do. This is the folding hardtop version, so you get the best of both worlds: top down summer fun when it’s nice out and a super quiet coupe for the ugly days. 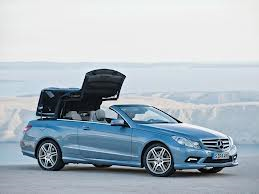 Our second pick goes to the Mercedes-Benz E350 Cabriolet. This is a large enough car to fit four adults comfortably, but not too big that it feels like a boat. It’s has all the comforts and convenience features of the big sedans, but has a top that folds down so you and your guests can enjoy the weather. Awesome. Our 3rd pick is a 2 seater, so you really need a small family to consider this a “family” road trip car. It made the list anyways because it’s such an awesome car. 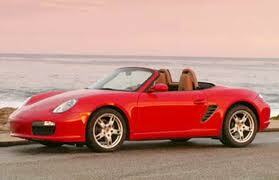 The Porsche is a true sports car. It handles, brakes an corners like only Porsche cars do. This is a great car for all types of driving also. They’re great on the open highway, the twisty back roads and everything in between. 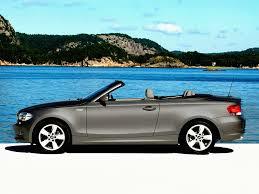 Our 4th pick is a BMW 1 Series Convertible. This is the BMW 3 Series’ smaller brother. The body is slightly smaller than the 3 series, but you can barely tell that from inside the cabin. There’s still plenty of space for four adults and these are a blast to drive. This car does have a canvas soft top also, so there’s more trunk space for luggage or small kids. 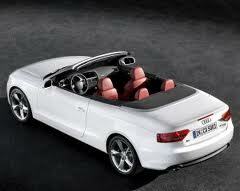 #5 is the Audi A5 Cabriolet. This is Audi’s competition for the BMW 3 series and hands down the best 4 seat convertible that Audi has ever produced. It’s available with a variety of engines and in front wheel drive or all wheel drive. This one has a soft top also, so decent trunk space. The ride quality is also good and it’s plenty sporty enough. A recent study by the NTSB shows the top 5 reasons people get pulled over while driving in the U.S.A. Pay attention to this stuff, it could help you avoid getting a ticket from the man. 1. Speeding. Of course this is #1. I hope the NTSB didn’t spend much money on this study. They found nothing groundbreaking here. 2. Texting or talking on your phone. Some states prohibit this, so get Bluetooth already and solve this problem. Bluetooth has been out for about 100 years, there is no excuse not to have it yet. 3. Hazardous Driving. 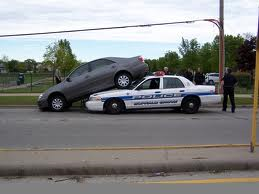 Police use this general term to classify anyone doing anything stupid on the road. Driving too fast in the snow or rain, shaving in the car, putting on make up, paying more attention to your burger than the road or changing your pants: all of these could get you a ticket. 4. Equipment Violations: This one is common sense. Failing headlights, brake lights, turn signals, etc. All of these are easily avoided with some proper maintenance. 5. Tailgating. Police love giving out tickets to folks who are showing signs of road rage. The best cure for this is to take your time and relax. Wake up earlier or leave earlier and give yourself extra time. 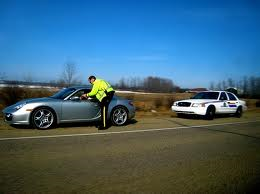 I know this is easier said than done, but you will definitely be late to wherever you’re going if you get pulled over. 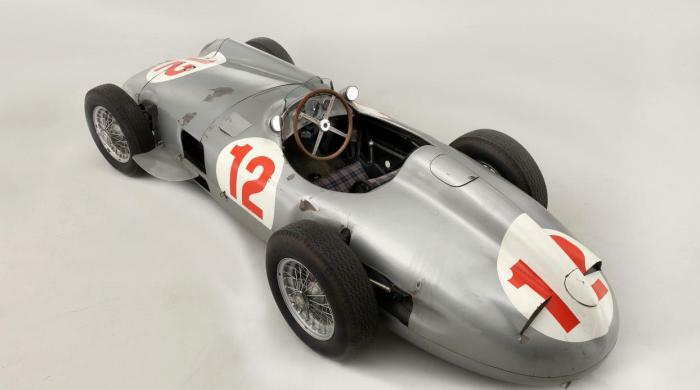 A 1954 Mercedes-Benz Formula 1 race car sold at Bonham’s auction house yesterday set a world record for the most expensive car ever sold at auction. A private collector paid $29.6 Million at the Goodwood Festival of Speed. 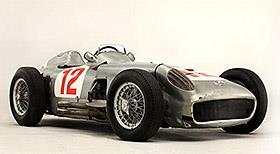 Juan Manuel Fangio took this particular car to victory in the 1954 German and Swiss Grands Prix races. It’s one of only 9 surviving race cars. The $29.6 Million price tag is not the largest price ever paid for a car, that honor goes to a 1957 Ferrari Testa Rossa that was sold at a private sale last year for $35 Million. It is the most that someone has paid at an auction though. 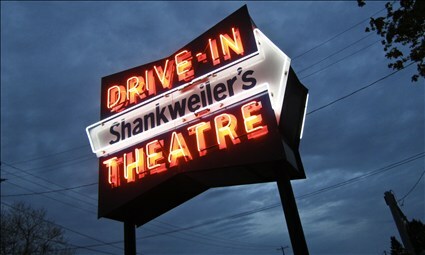 Here’s a good excuse for a road trip: Shankweiler’s Drive-in Theatre in Orefield, Pa is celebrating it’s 80th consecutive year of operation. They’ve made the leap from analog sound and video to HD screens and cd quality audio piped into your vehicle thru your FM radio tuner. Orefield, PA is located just west of Allentown, PA. It’s close to major highways and only 26 miles from eimports4Less’ corporate headquarters in Perkasie, PA. It’s also only 60 miles from Philadelphia, 95 miles from NYC and only 2692 from Los Angeles. Fuel up and load up on your favorite snacks. Time for a road trip ! It’s that time of year again. 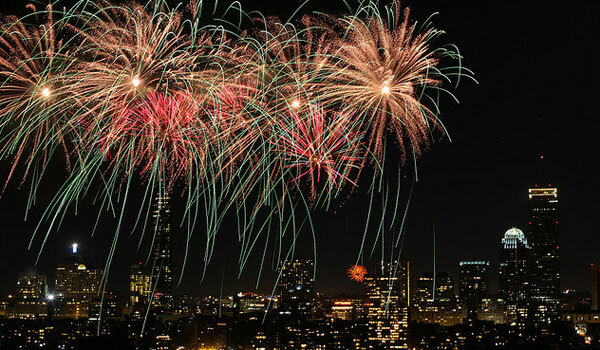 Time to make some plans for a road trip to your favorite Independence Day fireworks celebration. 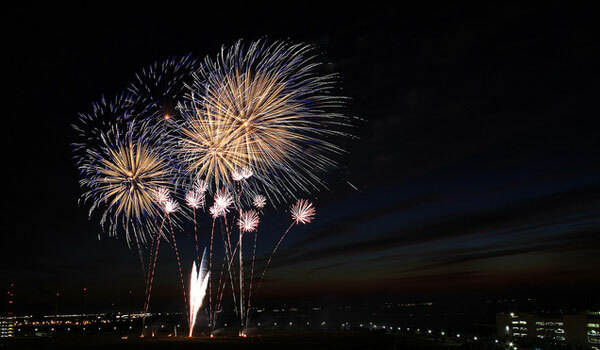 The pic above is Macy’s New York City display over the Hudson river. This show is consistently voted the best in the country due to turnout and quality. #2 is definitely Boston. Plus the city is small and manageable on foot. #3 is Philadelphia. 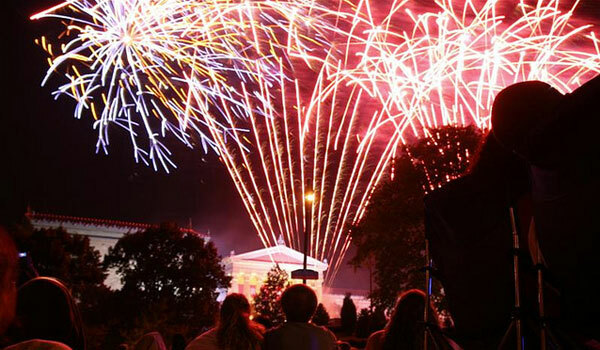 Plus, it’s the birthplace of this great country and has a ton of historical stuff to check out. 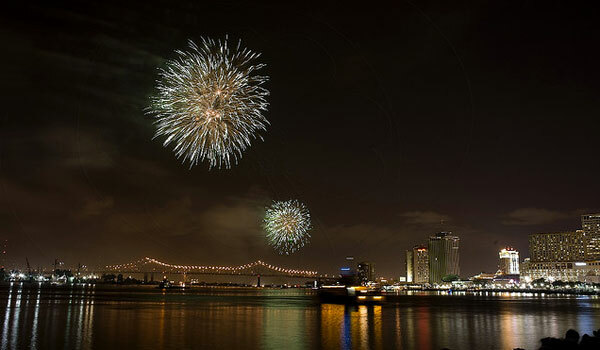 #4 is New Orleans. I've never seen this show, but the city is awesome. It gets our vote as #4 because of the party scene. #5 is Atlantic City, NJ. This show attracts almost a million people every year. 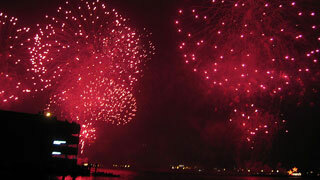 The city is broke, so I’m not sure where they get the dough to put the show together, but they do a great job.